Today you will experience hunger. You will eat but you will still be hungry. Today you will experience thirst. You will drink but you will still be thirsty. Today you will experience a thirst for peace and security. You will drink what the world offers but you will still thirst. Do you have a burden that is slowly digesting your strength? Has a broken relationship leaving you feeling empty? Does the future eat away your hope? Is unresolved conflict leaving you feel starving for peace? Has low self esteem eaten away at yourself worth? 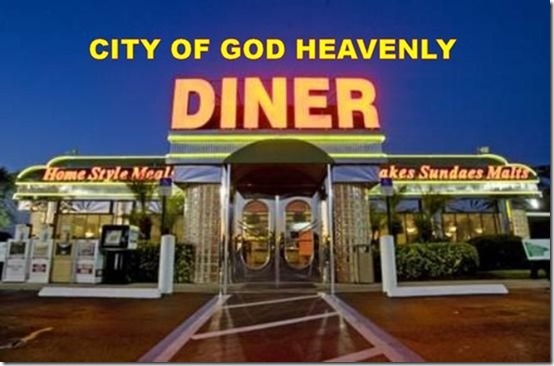 If you answered yes to any of the above questions then by all means you owe to yourself to step into The City of God Heavenly Diner where the food and drink is eternal and always free of charge! Sipping the wine your burdens and stress slowly dissipate and suddenly you’re very hungry. “I’d like the house special,” you hear yourself saying. Seconds later your meal arrives. “Shall I bless the food for you?” the Jesus asks. “Yes, please do.” you say. “Father,” the waiter begins, “For the food this person will eat I am truly grateful. May Your Spirit grace and strengthen the life of my friend. May they never hunger or thirst again for what does not fill or quench. Amen.” Then you take your first bite never in your life will you taste food so sweet, so delectable, so satisfying. Never in your life taste a drink so thirst quenching. At The City of God Heavenly Diner you can eat all you want and never get filled and you will never hunger again, you can drink and never get filled and you will never be thirsty again. Need to visit this diner more often, perhaps have forgotten how to eat, and drink from the eternal fountain and diner as I have been eternally on a diet – it does skew your thinking thanks for the reminder to be still, sit and eat with the Master Chef, and the Devine Waiter!! !